Now that you’ve installed our IDE and the Android SDK as well as created an AVD, you’re ready to continue our 31 Days of Android by creating our first Android application! In this application we’ll go through the boiler plate project template in Eclipse and enhance it’s its functionality a little bit. If you haven’t done so already, start Eclipse. Once it has started, go to File -> New -> Other (or type Ctrl + N / Command + N). 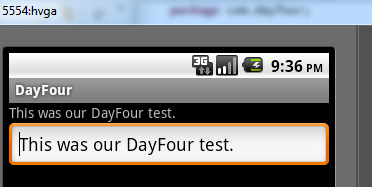 From there you can either find Android or type it in the filter text box at the top. You should see a slew of different Android options. Choose Android Project and click Next. Next, you’ll come to a Create Android Project window. The only thing you need to specify here is the Project Name. For this, name it DayFour. You will then be asked to select a Build Target. If you installed all of the Android SDK versions as detailed in our first post, you should see quite a few. If not, you should at least see the most recent, 4.0. Go ahead and choose API Level 14 for Platform 4.0 with target name Google APIs. We’re not going to do anything 4.0 specific; however, it’s a good idea to make your applications able to run on the latest version of Android (we’ll get into this a bit more in a moment). Once selected, click Next. At the top of our manifest you’re specifying your unique package name (com.dayfour), your app version code and version name, and the minimum SDK Version. After that, you have your application settings. At the top level you’re specifying our icon and label (don’t worry we’ll look at drawables and strings soon). Then, you have your activity. As you may recall from above, when you created the project, you told it to create an Activity as well and that is our DayFourActivity. The intent-filter stuff essentially specifies that this activity is what should launch when the app runs. Now let’s look at those @string things. Back in Package Explorer, expand the res folder and then the values folder. You should see a strings.xml file. Go ahead and open that. Again you’ll get a graphical interface for editing the file. Go ahead and click the stings.xml tab in the bottom of the editor. You should see two strings that were already created. If you look up above at the manifest where it shows @string/app_name, it’s referring to the app_name string seen here. This strings.xml file is basically a resource file. These are heavily used in Android to make it easier to localize your applications (and for other reasons you’ll see later). As an example, if you wanted to release your app in the US and in France. The default strings.xml file would contain English text. Inside of a res/values-fr/ folder we would have another strings.xml that would contain the French equivalent text. So going forward, if you want to add text to your UI or use it in your code behind, make sure you’re making use of these files. Next expand the res/layout folder and open main.xml. Once again, you get a graphical view. I usually flip between the graphical interface and the xml one, but for now, click on the main.xml tab in the bottom of the editor. We won’t really dig into this very much today. Suffice to say, the LinearLayout is a way of containing and organizing elements inside of it. The TextView is used to display a block of text. You’ll see again that we’re using a string resource to set our TextView’s text property. 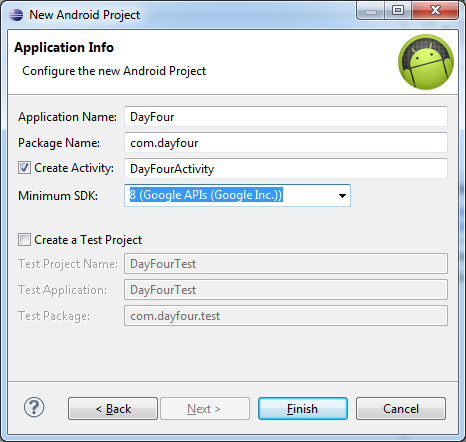 You can see here that the DayFourActivity class is extending the Activity class (which is part of the Android SDK). We’re only overriding one method from the Activity subclass, the onCreate method. This method is called when the activity is created and also when the screen is rotated. We call the super.onCreate method so the Activity subclass can handle it’s plumbing and then we call setContentView. This method is passed R.layout.main. R is a way to refer to the res folder and is how we programmatically access the items in that folder (and it’s sub folders). Here we’re pulling the id for the main layout we looked at earlier. You’ll likely see a red squiggly line under the TextView lines. If you hover over any of them, you’ll see a popup that says “TextView cannot be resolved to a type”. The reason for this is that you need to import the library that contains TextView. 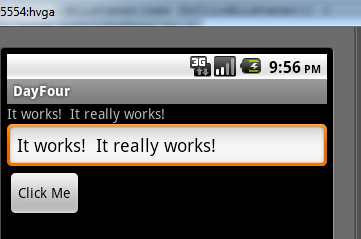 While hovering over with the popup, you should see a link that says Import ‘TextView’ (android.widget). You can click that or conversely you can hit Ctrl+Shift+O which will attempt to resolve all missing imports. Next we need to set our TextView’s text property to be your new string. Now, we want to change the text on the button from “Button” to our new string “click_me”. We can do that in one of two ways. We could go to the xml view and change the text property from “Button” to “@string/click_me" or you can right click on the button in the graphical interface and go to Edit Text. This will allow you to choose between the available strings and you can select click_me. Congratulations, you just finished your first event driven application. 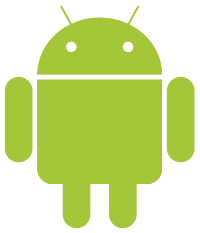 Plus you have a basic understanding of what files are present in an Android application and how things are structured. From here we’ll grow and expand this application when convenient and create new projects when necessary. If you’d like to download the final code for this example, you can grab it here.